All airsoft guns are required to have the tip (1/4 inch) of the barrel permanently colored in blaze orange. Ideal for law enforcement and special ops groups. 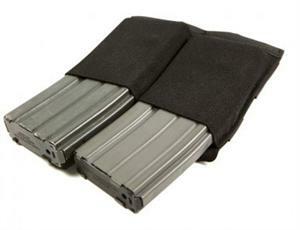 The Ten-Speed Double M4 Mag Pouch holds two M4 magazines and is the perfect blend of speed and security. Ten-Speed® pouches use military grade elastic combined with ULTRAcomp to create a multiuse pouch that is weighs almost nothing and lays flat when not in use. The Double M4 Mag Pouch holds two M4 magazines (polymer or metal), medical supplies, bandages, flash bangs, or other similar sized items. The Patent pending Helium Whisper® attachment system is compatible with all MOLLE platforms and built with a combat tested, high performance laminate that reduces weight up to 60% while equaling or exceeding the durability of 1000d CORDURA®. The latest material innovation of the Ten-Speed® pouches have been modified for optimized retention and greater durability. As with all Blue Force Gear, it is made with excellence in the USA and carries a limited lifetime warranty. .125" x 6" x 6"
Built for long lasting, rugged performance.